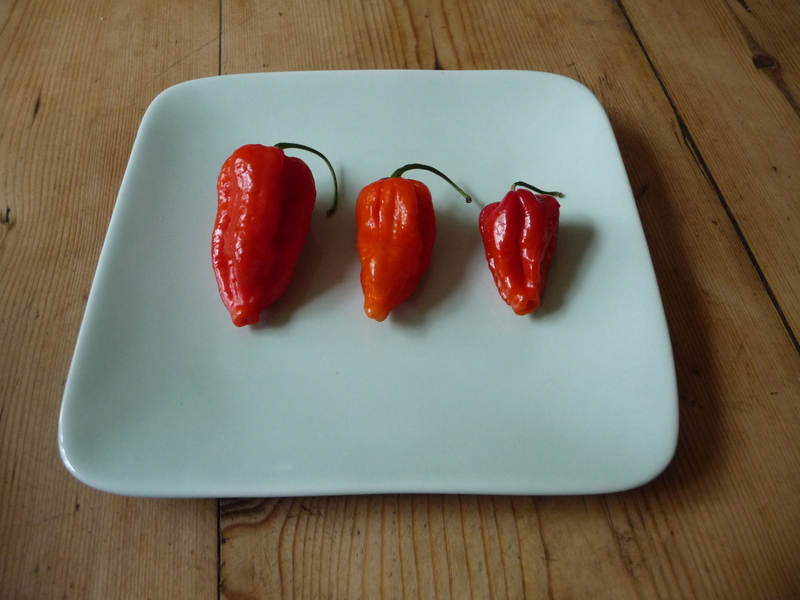 At the Abergavenny Food Festival a couple of weeks ago I bought some of the hottest chillies known to man – Dorset Nagas, the offspring of a Bangladeshi chilli known as Naga Morich. They are grown by Peppers by Post, a specialist chilli farm in West Dorset, run by Michael and Joy Michaud. According to Michael, these peppers register 1,000,000 Scoville Heat Units: just to put this into perspective, Scotch Bonnets, which I always thought were rather hot, reach a mere 150,000-200,000 units. I eyed the chillies I had bought with trepidation (they come with a warning not to leave them within reach of children or other potential unwitting victims). Finally, I chopped one in half, touched my finger briefly to its cut flesh and then tasted it. It was incredible – a searing heat, accompanied by a bewitchingly fruity fragrance. I’m glad, though, I didn’t try putting an actual piece of chilli into my mouth – that would have been overwhelming. It reminded me of something one of my classmates at the Sichuan Institute of Higher Cuisine told me: he said there was a Yunnanese chilli called the qixingjiao (seven-star chilli) which was so hot that people just trailed it in a panful of hot oil for a few seconds to give flavour to a dish, before removing it and hanging it up for use another time. I’ve never found such a chilli in China, although I did once come across some peppers called qixingjiao in a market in Hunan (these are the ones you can see in the photograph in my last blog post) – but they were obviously something different, because their heat level was disappointingly normal. According to Michael, Bangladeshis use this chilli green, before it has reached its peak of hotness. Only English people, determined to shock their friends, buy – and occasionally cook with – the red, ripened, scorchingly hot fruits. Chicken with chillies – or chillies with chicken? These peppers are pretty cool eh? I’ve only worked with the dried ones myself – a spice stored i worked for started importing them recently. I can remember unpacking 10’s of kilos of them, my eyes watering and burning just from the proximity to so many. I am a huge fan of yours and am immensely pleased to have discovered this new website of yours. I just finished your latest book, and it was a bit of a revelation for me in some ways; many insights it provided. Your two cookbooks I’m still working through (between the two of them I’ve made over 125 recipes). Anyways, I just wanted to say hello and to express how highly I think of your work, and how appreciative I am of it.